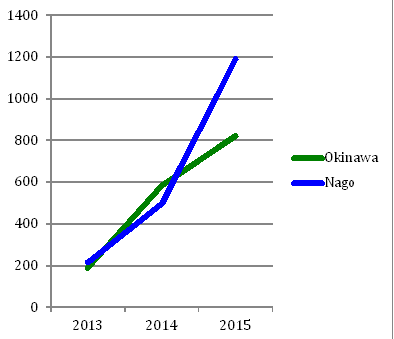 Contributions to Nago City through furusato taxes in fiscal year 2015 (calculated as of March 7, 2016) amount to about 257,780,000 yen altogether from 1188 taxpayers. This is about 12 times the total of fiscal year 2014 and double the number of contributors. Furusato tax contributions to the prefecture for fiscal year 2015 (calculated as of January 31, 2016) amount to about 44,090,000 from 820 taxpayers. This also marks an increase from fiscal year 2014, when furusato tax contributions amounted to 13,000,000 yen from only about 240 taxpayers. 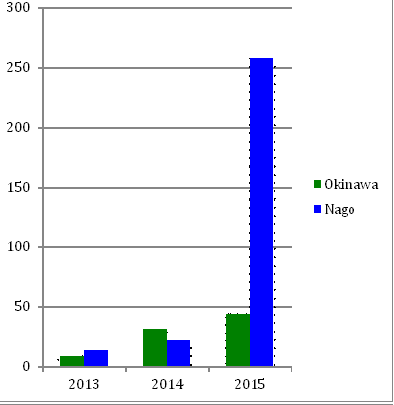 Nago City also received 200,000,000 yen from anonymous contributors in Tokyo Prefecture in December last year. Also starting last year, the Furusato Tax Program can be applied for online. Contributions increases are likely in part due to this change. At meeting of the Prefectural Assembly’s General Affairs and Administrative Planning Committee, head of the Prefectural Taxation Division Kaoru Sashida stated that, “Following Governor Takeshi Onaga’s inauguration in December 2014, [furursato tax] contributions have been increasing.” She explained that, “Individual contribution amounts vary from 300 yen to 3,000,000 yen, averaging at 5,300 yen.” Shashida made this comment in response to a question by assemblyman Osamu Toguchi of the Communist Party. According to the Taxation Division, taxpayers are writing messages of encouragement and support when they make their contributions.